My white Army – Nina, the Von Gierke’s warrior! Hello Warriors! Our team is growing! Today I would like to introduce my White Army: a group of Warriors that every fight so that all babies here in the hospital get better and leave as soon as possible. One day, one of them told me: “Nina, I really want you to leave and not to come back… and I will miss you so much” I must admit I was a bit confused. She wants me to leave, she does not want to see me here again… and she is gonna miss me? Well, I thought a bit about it and I realized that this sentence is very illustrative about how much they care for me. In this picture you can see some of those warriors: Sara, Aurora, Reme, Toñi, Encarni, Maria. There are many more that were not present that day and we are extremely thankful to all of them from the botton of our hearts. 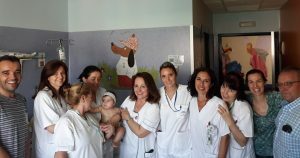 Doctors, nurses, assistants, therapists, our friends in charge of hygiene, food, administration, patients’ guidance… and a Physiotherapist and a Case Manager about whom I would like to talk another day 🙂 The whole team in the Hospital Materno Infantil Virgen de las Nieves in Granada deserves the best. We would also like to thank Doctor Maldonado and his team. He is a very good Doctor and a very good person…that is an excellent combination! He knows a lot and he is able to explain clearly everything he knows. He is patient and a good listener. Thanks DOC! Thanks also to all those Health care professionals who wake up motivated everyday in order to improve their patient’s lives and to all those who struggle to keep on improving the system. A big NinaHug to all of you.